As always, our chapter kicks off each month with the Lake Merritt walk on the first Saturday. Experienced and virgin pilgrims are always welcome. This new documentary might be of interest to pilgrims. There are 8,000 miles of roads and paths in New York City and for the past six years Matt Green has been walking them all – every street, park, cemetery, beach, and bridge. It’s a five-borough journey that stretches from the barbershops of the Bronx to the forests of Staten Island, from the Statue of Liberty to Times Square, with Matt amassing a surprisingly detailed knowledge of New York’s history and people along the way. Fitness for the Trail & for LIFE is a full day fitness training session designed to enhance your ability to maintain physical health, quality of life, and experience happy 2019 adventures. Individualized movements and programming focus on improving your foundation, longevity, joint health, spine function, balance, posture, endurance, strength, and flexibility. This is a small group class geared to the issues and concerns of the participants that will holistically help you maintain your ability to be outside, enjoy your adventures and maintain your quality of life. This class (which Jayah considers to be the most important one she teaches and it’s not a poles class) meets in a stunningly beautiful location that gives us wonderful opportunities for learning or practice – rain or shine. Registration is required at East Bay Parks and Recreation. National Parks Fee Free Day for the Birthday of Martin Luther King, Jr.
National parks across the country are waiving entrance fees on five days in 2019 as a way to encourage people to get outdoors and spend time with their friends and family in their national parks this year. See details. 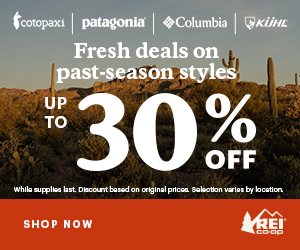 This fee-free opportunity applies to entrance fees only and does not affect fees for camping, backcountry reservations, tours, or other special uses. Learn more. Please note: this is not an organized Camino chapter event. Rather, it seems like a fun thing to do on a Friday night, so if you love Flamenco, check it out. Caminos Flamencos presents an intimate performance at The Terrace Room Restaurant. Caminos Flamencos, created and directed by, Emmy Award-winning dancer and artistic director, Yaelisa. Caminos Flamencos invites the community to celebrate this rich cultural performance. Yaelisa creates and presents contemporary, traditional and theatrical dance programs showcasing artists from Spain and the U.S., which reflect the changing face of flamenco in the 21st century while preserving the history and culture of this traditional art form. Welcome the New Year with a hike and labyrinth walk at the end of the world! This 12-mile loop route starts at the historic Beach Chalet building at Ocean Beach and continues along the coastal Lands End Trail and ends back at the Park Chalet restaurant for an optional post-walk dinner. Lands End Labyrinth, San Francisco. Photo by Stephanie Dodaro. Meet us at 9:30 AM for sign-in and briefing at the Beach Chalet building, just inside the doors next to the gift shop, located at 1000 Great Highway by Fulton St. We expect to arrive back around 5:00 PM. This is a moderately difficult, 12-mile loop with 1,240 feet total elevation gain. Mostly dirt trails with about 2.5 miles along city streets. This is a great opportunity to do some Camino training, but it’s best if you’ve done at least a 6-mile hike before. Open to all (members and non-members). Rain or shine. Led by chapter members, Sue López and Stephanie Dodaro. For more details, see the event, Lands End Hike & Labyrinth Walk, on our NorCal Facebook group. For insurance purposes, we are unable to welcome dogs, except service animals, at our events. In December 2018, Andy Cohn and Kate Stewart walked the last 100 kilometers of the Via Francigena (VF), one of the three great medieval Camino routes that runs from Canterbury, England to Rome, Italy. They will talk about their particular experience, and about the Italian section (almost 1000 kilometers) in general, focusing particularly on the “How to?” logistics — lodging, transportation, the difficulties of the terrain, etc. Andy and Kate have made five trips to Spain since 2012, walking the Camino Francés (SJPDP to Finisterre and Muxia), the Portugués from Porto, the Primitivo, the whole of the Norte, and most of the Inglés (as dessert after finishing the Norte). Andy fell in love with Italy in 2008, when he and Kate did a week-long walking trip through Tuscany, passing through much of the countryside traversed by the Francigena. Since 2008, Andy has made nine trips to Italy, spending almost a year there, has learned Italian (more or less), and on his own or with Italian hiking clubs has tramped through the Dolomites, the Apennines, and chunks of Tuscany, Sicily, Campania, and Sardinia. This is a Camino to die for — mixing the Alps, the intense green Apennines, the golden light of the Tuscan hills, one stunning medieval town after another, and Rome at the end. What’s not to love? We encourage veterans of the Via Francigena to share their experiences. RSVP: Click here to sign up by 12 pm on Tues. January 29th. By BART: The North Berkeley BART station is .7 miles away. From the station, walk down (west on) Delaware, turn left on Curtis, and then right on University. Carpool: If you want a ride or can give one, post a message to this event listed on our Facebook Group page (Peregrinos – Northern California). Parking: The West Berkeley branch of the library is on the north side of University about 100 yards east of (above) the intersection with San Pablo. Free and plentiful street parking after 6 PM. Also, there’s a large and free parking lot which can be accessed either on San Pablo Avenue (by Dollar Tree), or on University just below the library. Electric vehicles parked in front of the West Branch Berkeley Library can use a publicly-available curbside charging station, powered in part by solar panels on the rooftop of the library. For those who enjoy Spanish food, stop by La Marcha Tapas Bar, for a pre-event Happy Hour, located around the corner at 2026 San Pablo Ave. This is also a good option for dinner after the presentation. And because La Marcha is a Spanish restaurant, there’s another Happy Hour from 10 pm to midnight! Questions? For questions about the Via Francigena, email Andy. If you haven’t taken the NorCal chapter survey yet, please take a moment to share your feedback. 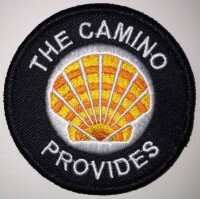 Help us celebrate our pilgrims heading out to the Camino this year at the NorCal chapter’s annual Blessing & Shell Ceremony Potluck. Once again, we’ll gather at St. Augustine Catholic Church in Oakland, located at 400 Alcatraz Ave. off of College Ave. I wish you all a splendid 2019! For those who might enjoy some different ways to alleviate stress, check out my new Yoga & Wellness website at lferris.com. The 2019 patches have arrived! Hi Laurie, Good to see you….. Would love to hike with you tomorrow, but not going to be able to make it.